1. Independent suspension system:Four wheels are installed independent suspension spring, let the cross-country car body more flexible and also play the shockproof function for the body to protect the electronic components inside the car body. 2. Maximum speed 25 km/h :Strong power motor provides high torque to ensure the car complete difficult moves. No matter land, sandy beach, mud, wetlands, grasslands, rugged stone mountain road, rocks can be breakthrough easily. 3. High-quality tires:Adopted rubber tires with deep gully for strong grip ability, high friction, and anti-skid performance. You can make a sudden turn or stop at high speed easily. 4. 2.4GHz frequency:The 2.4GHz frequency with anti-jamming capability allows to race at the same time in the same area. 5. Pistol remote control with ergonomic design for easy control, and wonderful hand feeling . 6. 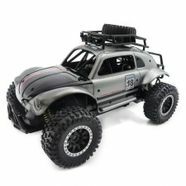 1:14 cool off-road car, an attractive house ornament .